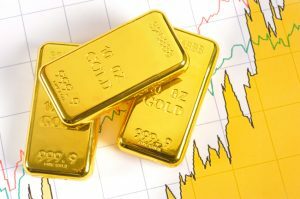 HomeGold IRA BlogBuy GoldWhen Should I Buy Gold? When Should I Buy Gold? Do you want to know the perfect time to buy gold (or other precious metals) for your retirement portfolio? The short answer is: There is never a “perfect” time. Gold is not a timing-based investment (or, at least, it shouldn’t be treated that way). Don’t approach gold like you would with shares of Coca-Cola or Apple. Unlike stocks or real estate, gold does not represent ownership in a revenue-generating, cash-flowing asset. Gold can’t go bankrupt or pay recurring dividends. Instead, approach gold for what it is: a diversifying, wealth-protecting, timeless asset. Physical gold is a primary asset that does not rely on someone else’s liability—this is gold’s baseline characteristic and one of its many strengths. Thus, the real answer to “When should I buy gold?” is that you should buy gold when you need it (the sooner the better) so long as it fits into your present financial reality. Most gold investors buy precious metals for three reasons. They want a safe-haven from macroeconomic uncertainty. They want to diversify their portfolio. These are both reasonable and responsible objectives. The world is full of uncertainty, and today’s national governments seem obsessed with generating inflation and borrowing obscene amounts of money. Monetary and fiscal policy appear to be governed by short-sighted, knee-jerk politicians and bankers. Gold, of course, remains valuable no matter who sits in the Oval Office or chairs the Federal Reserve. Moreover, gold prices do not correlate closely with real estate, bonds, or public equities. Precious metals tend to be very resilient when a bubble bursts in the stock market or bond market. For investors who value the principle of diversification, gold makes a lot of sense. Consider your own financial life. If you are a 23-year-old college student with $1,000 in the bank and rent due in two weeks, gold is probably not the best move—even if you fully understand gold’s value and grasp its potential for your long-term future. If, however, you have the liquidity to make an additional investment, the best time to grab gold is as soon as you need it. Timing for gold doesn’t improve over time. Yes, there are periods when gold rises and periods when gold falls, but the responsible gold investor understands that gold is a long-term game. The best uses of gold in your portfolio are not speculative. Gold is, ultimately, protection against uncertainty. So, as soon as you have assets that are vulnerable to economic uncertainty, you should think about safeguarding your wealth with gold. If you have worked hard, saved, and invested in other assets, gold can represent a de facto insurance policy on your financial life. It isn’t perfect, but it’s tried and tested. Gold is always valuable. It tends to be most valuable when everything else is falling apart. Gold is your “in case of emergency, break glass” asset. So make sure you have it before the emergency arrives. It has been said before on this platform, but don’t buy gold if it’s not for you. Precious metals are a specialized asset class. Do not feel pressured to pack your retirement portfolio with gold or silver if you don’t feel comfortable doing so. Gold is a great asset with a tremendous history and unique advantages. That does not make it a panacea, and you are not guaranteed a happy financial future just because you own some gold. You see gold as a speculative opportunity in the short-term. Gold is not a penny stock or a futures contract. It is not well-suited for get-rich-quick investment schemes. Always treat gold as a secure, long-term investment that is part of a broader portfolio strategy. You have more immediate, urgent financial needs—such as a mortgage payment or medical expenses—and limited financial resources. Precious metals already comprise a large portion of your retirement portfolio and you lack exposure to other major asset classes, such as equity or real estate. If you believe gold is the right purchase for you, and this is your first experience with gold, American Bullion can help you open a Gold IRA or find a safe, tax-advantaged depository.